For the second year running, I’m proud to say, I managed to make all of my Christmas cards again. I send over 100 cards, so for most I need to come up with a simple design that’s easy to mass produce and isn’t too expensive to post. 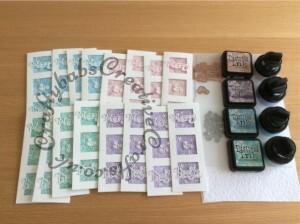 I used stamping for half of them and die cutting and embossing for the other half. I also made a couple of special ones for family and close friends. If you want to see full sized versions of any of the pictures just click on them. 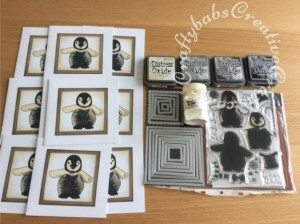 For the stamped cards I used the ‘Be Creative Clearly Stamps Pebbles The Penguin Set, I stamped the layers with toning shades of Tim Holtz Distress Oxide Inks onto white card and added heat embossed holographic clear embossing powder to the last layer. 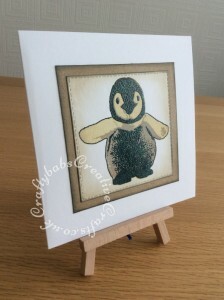 I matted the stamped images onto Kraft card Mats die cut with stitched nesting square dies and inked with the same distress oxide inks. For the Die cut and embossed cards I used some aperture card blanks that have been sitting in my stash for ages. I embossed A4 sheets of thin white card using an Embossalicious A4 embossing folder. 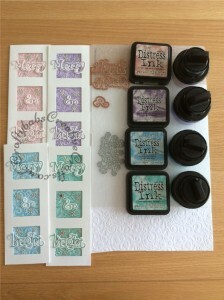 I then inked the whole sheet with diistress ink and then went over with a toning shade of Cosmic Shimmer gilding polish. I die cut the sentiments with the Spellbinders – Christmas – D-Lites – Holiday Merry and Bright set and dry embossed, inked and gilded through the dies. 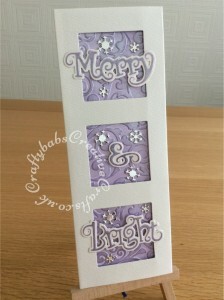 To add a touch of highlight I added tiny snowflake die cut using the Tattered Lace Dies – Essentials Tuck In Christmas Snowflakes die. And finally, some of my special cards ended up being Christmas plaques not cards. 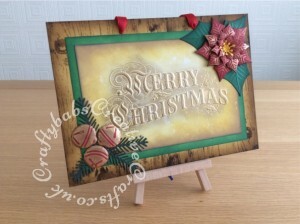 I was experimenting with the Crafters companion Gemini 5″ x 7″ 3D Embossing Folder – Merry Christmas and was so pleased with the results that I though it would be nice to make something that could be used every year rather than being discarded after Christmas. I mounted my finished matted and layered fronts onto pieces of mountboard which I inked through a Minc Woodgrain Art Screen (tough going as they’re not really meant for inking like a stencil). The embellishments were die cut using Spellbinders Shapeabilities Layered Poinsettia Dies S5-055, Spellbinders ribbon & bells die set and unknown brand pine needles dies, all embossed and inked with distress ink then embellished with Pebeo gilding wax.